Baby, it’s cold outside! And stiff, numb fingers take the fun out of winter snow like nothing else. When regular gloves just aren’t cutting it, our heated gloves reviews are here to help! We researched best-selling products and reviewed the “best of the best.” But before you start in on the reviews, check out these specs to help you choose the best heated glove option for you. Heat Levels: Some heated gloves are either “on” or “off,” while others can be changed to different heat settings. Rechargeable: Rechargeable batteries are convenient and often lighter than disposables, so they’re perfect for heated gloves! 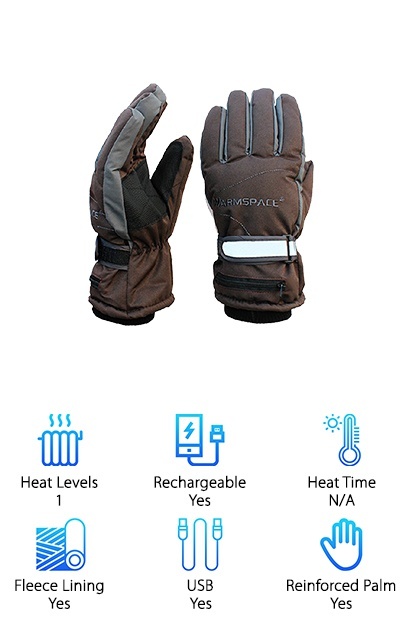 Heat Time: The battery life of heated gloves varies depending on the voltage and heat level setting you’ve chosen. Fleece Lining: Fleece lining offers luxury and comfort as you keep your hands warm while you go about your day. USB: A USB charging cord lets you charge just about anywhere with the right adapter, from in the car to at home. Reinforced Palm: The palm receives a lot of wear and tear, so a reinforced palm is a good idea for winter chores and adventuring. Are you rubbing your hands together with anticipation, or to warm them up? Let’s get into the reviews before they get any colder! Our top pick and budget pick are our overall favorites among heated gloves, combining value and features in a great way. We also reviewed eight other strong contenders, from top-of-the-line heated work gloves to more basic fashionable options. It’s time to leave numb fingers behind for good! Our pick for the best heated gloves: this option from Ivation. Sizes include S, M, or L with three heat settings lasting up to seven hours! The nylon outer is reinforced with PU leather on the palm for extra grip. To change the heat level, press the Ivation logo on the back of the glove and watch it change from red to orange to green depending on the setting! The heating elements cover the back of your hand and fingers to provide total warmth. These gloves work well for outdoor exercise and basic chores in cold weather, but for subzero conditions and tons of winter chores you may prefer a tougher glove like those offered by Volt. 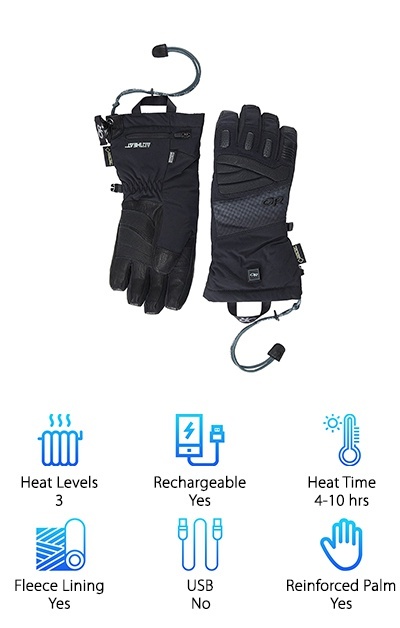 For the average person looking to enjoy the outdoors while still being able to feel their fingers, these heated gloves are a great value with a surprisingly low price! Available in blue or gray and a few size options, the Winterial gloves are tough and incredibly useful with touchscreen-compatible fingertips and reinforced rubber palms and finger pads. The batteries charge in 2-4 hours with the included wall USB dual charger and last up to eight hours on the low heat setting. You can adjust the heat setting by pushing on the Winterial logo on the back of the glove. An LED behind the logo changes blue, green, or red depending on the setting you’ve selected. The heating elements are located on the back of the palm and extend down the fingers for total warmth. The adjustable wrist cuff tightens the gloves in place and keeps out snow, too! 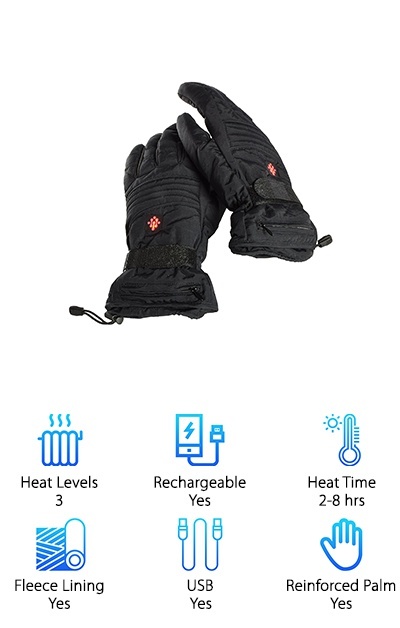 These are one of the cheapest heated glove options that heats the fingers as well as the back of the hand, and should work well for outdoor winter sports. The Flambeau Heated Gloves come in S, M, L, and XL sizes with a long cinching cuff to keep out cold and moisture. Made with tough nylon with a reinforced thumb and soft fleece lining, these waterproof yet breathable gloves can keep your hands warm and flexible on cold days! Lithium ion batteries power the heating element, which can be set to high, low, or off. The heating element extends over the palm and the length of the fingers to heat the areas that need it most! The adjustable wrist strap and cinching cuff provide more security. These heated gloves are a good option for skiing, snowboarding, and other outdoor adventures. One charge lasts up to 5.5 hours, and you can turn off the heat to conserve battery life for long hours spent out in the snow. They’re also a great option for winter cyclists--both motorized and foot-powered! 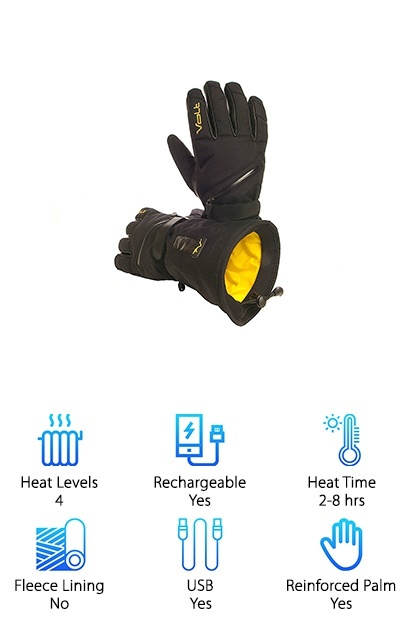 Available in S, M, or L, the Morvat Heated Gloves have a similar design to the more expensive Volt options with four heat settings and a viewing window for the battery pocket. These gloves are water-resistant, with a nylon shell and lightly reinforced fingers and palms with a warm fleece lining. The heating element covers the palm, back of the hand, and each finger to provide heat where you need it most. The heat setting can be adjusted through the battery pocket’s viewing window without opening up the waterproof zipper. An extra pocket on each glove provides room for storing additional batteries or other small items. The gloves come with a dual wall charger for charging up the batteries for each glove at the same time! An adjustable wrist strap and cinching cuff provide additional barriers against cold and moisture. These tough gloves can handle a range of conditions! 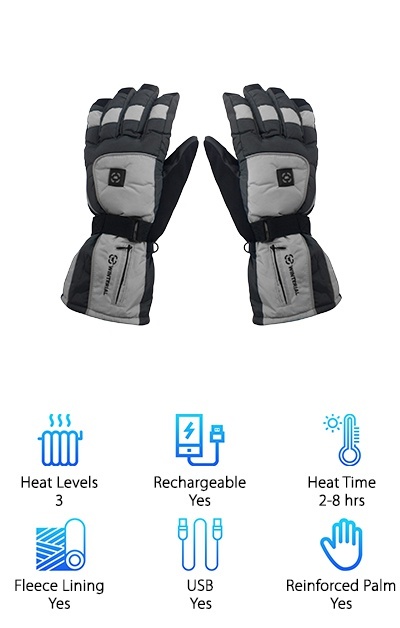 If you don’t need ultra-heavy-duty heated gloves but want something that will keep you cozy on the trip to work or class, you may like these heated gloves from BIAL. The fashionable leather design, available in a men’s one-size or women’s one-size option, is sleek and comfortable. The waterproof leather outer can keep moisture and wind away from your skin, while the thick fleece lining provides extra warmth. Just plug in the battery and it will start heating right away for up to four hours. The heat is concentrated in the back of the hands but also conducts into the fingers. The gloves are touchscreen-friendly, ideal for using your phone on the go! If you want to do outdoor chores in freezing weather, these gloves may not be the right choice. But for making your commute a little more pleasant on cold days, these fashionable heated gloves should do the trick! The Volt Tatra 7V heated gloves are available in sizes S-2XL in men’s and S-L in women’s. Made from heavy-duty nylon with a reinforced leather palm, thick insulation, and tricot fleece lining. One of our favorite features with this product is the dual wall charger that lets you charge the batteries for both gloves simultaneously! The batteries last 2-8 hours depending on which of the four heat levels you choose. The batteries zip into a waterproof pocket with a viewing window that lets you see the heat level indicator LEDs. You can adjust the heat setting without opening up the pocket! 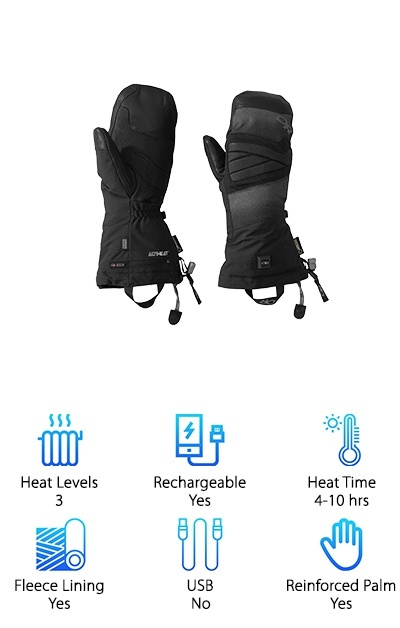 If you need a sure-thing heated ski glove or snowboard glove, Volt is the way to go. The heating elements totally cover your hands from wrist to fingertip, including each finger and the sides of your hand. These high-end heated gloves are a big step up from gloves that concentrate the heat on the back of your hand only! Choose from XS, S, M, L, and XL sizes to get the perfect fit with these heated gloves from Outdoor Research. A GORE-TEX insert makes these gloves waterproof, while a nylon outer with goat leather palm reinforcement provides a tough barrier to the cold and wind. EnduraLoft insulation and a fleece interior lining made with Tricot and Moonlite Pile can help keep your hands warm even without the heater! The rechargeable lithium ion batteries provide three heat level options to handle cold, colder, and coldest. The gloves feature elastic at the wrist and a cinching cuff to seal out frigid air and moisture. The heating elements extend down through each finger to provide wrist-to-fingertip warmth. It’s the fingers that need the heat the most, after all! If you want a boost of additional warmth with a mitten design, take a look at our Outdoor Research Mitts review, too! The Outdoor Research Mitts come in sizes XS, S, M, L, and XL and have a ton of awesome features to keep your hands toasty warm. 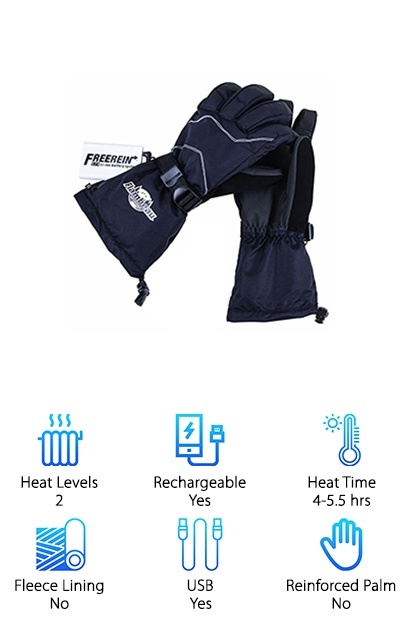 The mitten fit is a great option for retaining heat, although you have less mobility than with gloves. A rechargeable lithium ion battery provides three heat level options contained in a locking zippered pocket. The mitts are made from nylon with GORE-TEX inserts for waterproofing, plus a reinforced goat leather palm and EnduraLoft insulation. The Tricot Fleece and Moonlite Pile Fleece lining provides another layer of comfortable warmth! These tough mitts can help you handle the coldest of cold weather with their windproof and waterproof design. An elastic wrist and cinching cuff provide additional protection against snow and water. The heating element extends over the thumbs as well as the back of the hand, so no fingers are left behind! 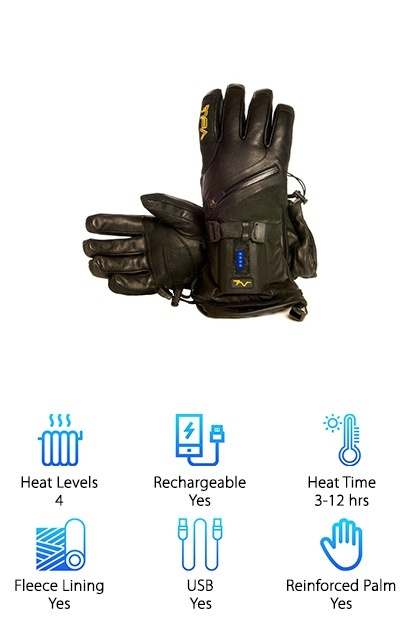 The Global Vasion Heating Gloves use 3.7V batteries to provide heat to the backs of your hands that spreads to your fingers and thumbs. These waterproof gloves are made with a breathable lining, reinforced leather palm, and tricot fleece lining. An adjustable wrist strap and cinching elastic cuff provide a good fit and keep out moisture. 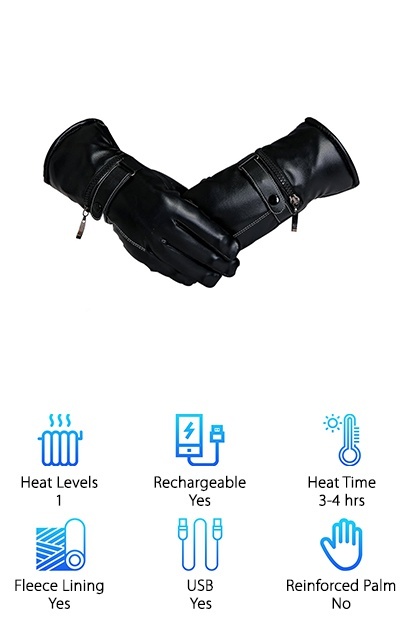 These gloves start heating as soon as you plug in the batteries, and will keep going until the batteries run out or are removed. If you’re looking for a simple pair of heated gloves to give you an extra boost while you’re outdoors in cold weather, these inexpensive gloves might be your new best friend! They aren’t as fancy as some options out there, but they do the job. Most people find that the gloves are comfortably warm even without the heat on! They should work well for skiing and snowboarding as well as basic outdoor activities. Available in S, M, L, XL, and 2XL sizes, the Volt Heat 7V Titan gloves are made from waterproof leather and nubuck leather with a breathable Aquatex waterproof membrane and tricot fleece lining. The four heat levels can provide up to 150 degrees of heat throughout each finger and thumb as well as the sides of your hand, leaving no area out in the cold! 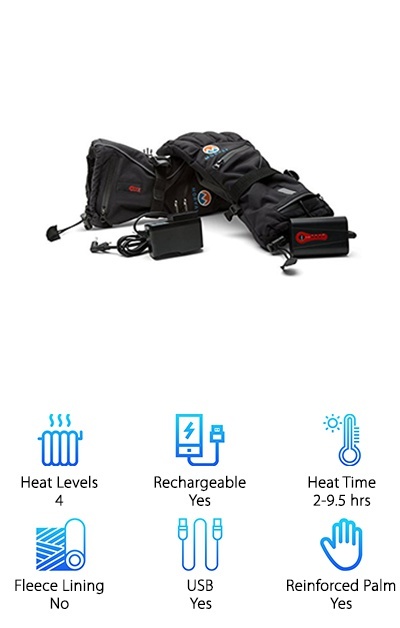 The four heat levels are controlled by a microprocessor powered by rechargeable batteries that last 3-12 hours depending on the heat setting. These waterproof gloves are reinforced in the palm and wear areas around the fingers. The battery slides into a pocket with a display window so you can view the LEDs indicating the heat level setting and change the heat setting without taking out the battery. Keep your wrists and hands totally protected from the elements with the adjustable nylon wrist strap and elastic cinch cord cuff!